Fannie Mae is charging taxpayers millions for upgrades to its new headquarters, including $250,000 for a chandelier. The inspector general for the Federal Housing Finance Agency (FHFA), which acts as a conservator for the mortgage lender, recently noted $32 million in questionable costs in an audit for Fannie Mae's new headquarters in downtown Washington, D.C.
Fannie Mae will be the flagship of Midtown Center, which is scheduled to complete construction in June 2018. The inspector general reported that costs for the new headquarters have "risen dramatically," to $171 million, up from $115 million when the consolidated headquarters was announced in 2015. The inspector general blamed expensive upgrades for cost overruns, such as a third glass walkway costing $2 million to connect Fannie Mae buildings, $1.2 million for "decorative wood slatted ceilings," decorative wood "lunch huts," and pergolas, or garden-style pavilions, in elevator lobbies. FHFA officials have had poor oversight of the project, according to the inspector general, because they "did not review whether any of the major upgrades were cost-effective or whether lower cost alternatives were available." Among the upgrades: a $250,000 chandelier that no one was quite sure what it was for. "For example, we identified an upgrade in the 80 [percent] General Contractor construction design documents identified as a $250,000 chandelier," the inspector general said. "The expert's representative explained that the expert first thought it was a light fixture but learned later that it was an ‘architectural feature' for the trading room, intended to ‘evoke' the activity in that room and assumed that this feature was part of some ‘government art program.'" The acting deputy director of the FHFA told the inspector general he was "unaware" of the pricey chandelier, but said he would "question the expenditure of $250,000 for a piece of art." "We found no evidence, however, that FHFA has ever challenged this expenditure," the inspector general said. After the inspector general inquired about the chandelier, officials scrapped plans for a $150,000 "hanging key sculpture," and $985,000 for "decorative screens" in a conference room. 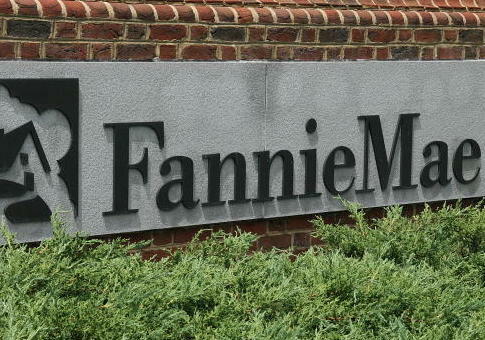 Fannie Mae said it canceled the projects out of "concern that they could create an unwarranted perception of our efforts to execute our workplace strategy in the best interest of the taxpayer." Rep. Bill Huizenga (R., Mich.) highlighted the lavish spending during a Financial Services Committee hearing Tuesday, taking FHFA director Mel Watt to task for Fannie Mae's $56 million cost overrun. "Good news. I discovered what a wooden lunch hut is," he said. "Keep the wooden lunch hut, cancel the damn spiral staircase." "You are making K Street law firms and lobby shops jealous," said Huizenga, who co-owns a gravel company and worked in real estate and development in the private sector. "They want to move to 15th and L. They want to move off K Street if this your headquarters." Other upgrades approved as reasonable by the FHFA expert leading the oversight of the Fannie Mae headquarters were $7.7 million on interior finishes and detailing. FHFA's expert found the work to be at a "very high level of quality, particularly with respect to finishes in the circulation and collaboration spaces." The costs included $2.5 million for wood "veneer finishes," $1.2 million for "decorative wood slatted ceilings," $750,000 for "format tile for core wall elevations," and $540,000 for "gypsum ceiling detailing." "FHFA's expert noted that the level of detailing was ‘pretty intense' and in the realm of ‘high end design,'" the inspector general said. "It concluded, however, that these features and finishes were ‘consistent with those found in major financial institutions or law firms and may be instrumental in attracting future employees to Fannie Mae' and were ‘reasonable enhancements.'" Taxpayers are also being billed $4.1 million for a cafeteria that the officials have warned will be underused and $700,000 for a broadcast studio. "Light-filled town centers" at the headquarters are costing $2.1 million, to provide what the FHFA said is a "much-needed sense of openness and day lighting, necessary for human interaction and productivity." The FHFA already approved two multimillion-dollar glass walkways on the 11th and 13th floors of the headquarters. 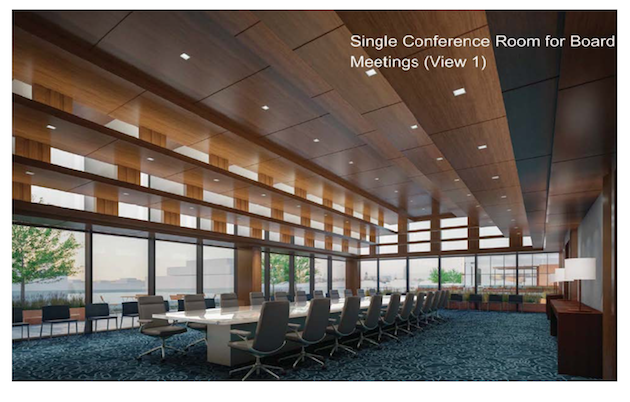 Now, Fannie Mae is adding a third $2 million glass bridge on the 9th floor, to "further enhance the interconnectivity across nearly all its floors." The inspector general noted that the cost of the upgrades could be "significantly higher." The audit identified $9.6 million in additional questionable upgrades in the contractor's budget for the headquarters, including, "cabinets in a copy room, pantries, wood doors, bars, and quartz and glass countertops in a wellness room, town center café, and a ‘CC lounge'; free-standing decorative wood ‘lunch huts,' custom wood menus for the Sky Lobby café, and elevator lobby pergolas." The inspector general began providing oversight of the project in 2016, after receiving an anonymous complaint about "excessive spending by Fannie Mae." FHFA officials have argued the new Fannie Mae headquarters, which features modern "collaborative workspaces," is "in line with corporate America" and that Fannie Mae was "doing it the right way." An FHFA committee member overseeing the project told the inspector general there was "no way" for the agency to evaluate Fannie Mae's spending on "little things" like the upgrades listed in the report. The committee member said "such features were consistent with those used in large financial institutions." FHFA director Watt pushed back against the report and said the new Fannie Mae headquarters will "benefit taxpayers." "I consider the build-out features reasonable, cost-effective and consistent with my responsibilities under the law and I, therefore, did not object to them," he wrote in response to the audit. "Some of these relate to the effective and efficient operation of Fannie Mae's market room, which provides critical capital markets financial services to help support and sustain the U.S. housing market." This entry was posted in Issues and tagged Fannie Mae. Bookmark the permalink.